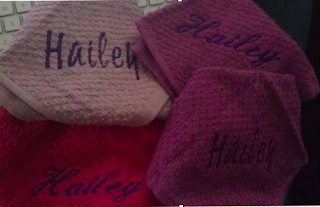 Hugs for Hailey: Hailey's Hankies and other handmade things. I love crafty people. People who can create. I have always wanted to be crafty, I have always tried. I have made a quilt for Hailey before and really liked how it turned out, but didn't like how long it to to make it. I used to stamp and make cards and I really liked that, but I didn't like the clean up and putting everything you need back in it's place. I love doing our necklaces and with it having a semi-permenant messy area in my house is helpful. When people are able to create things I find it amazing and I really envy them! Hailey has a lot of special people in her life. One of those people is her 1 on 1 aid at School, Ms. Sallie. Hailey sees Ms. Sallie when Hailey goes to school and Ms. Sallie helps Hailey in every way. She pushes Hailey's wheelchair, she plays with Hailey and she makes sure Hailey is safe and happy. Since Hailey was put on muscle relaxers for her spasms she has been drooling a lot. She can not wipe it away herself so we are constantly doing it for her. Ms. Sallie helps Hailey do this while Hailey is as school. I had always just had Hailey take a kitchen towel to school with her. 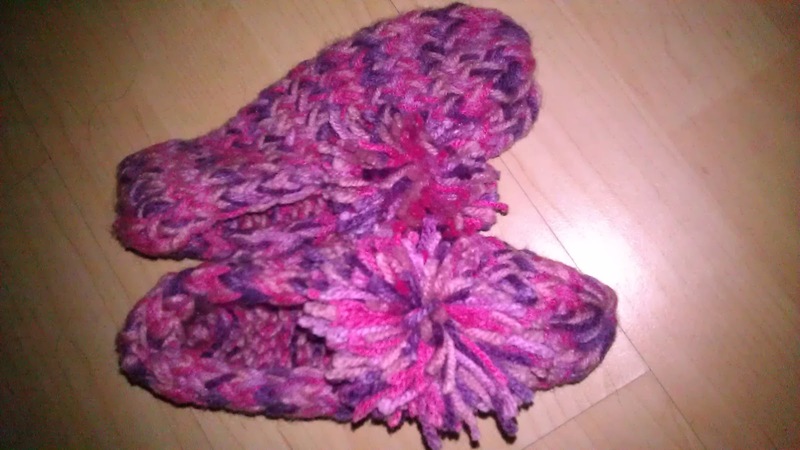 When Hailey got these for Christmas I said how useful & creative I thought they were to everyone I talked to that day. Now I have these all over my house! Hailey also received some boot covers from Ms. Sallie and have come in handy with the temperatures dropping so low here. Another gift Hailey received for Christmas is a knitted hat with a big pink flower on it and some AFO long boot covers. I love how people have shared their talents with Hailey. We really appreciate it so much! Thank you! !